Dining is clearly a spot where Paul Gauguin Cruises has invested a significant amount of its resources. Across the board, dishes are imaginative and perfectly crafted; it's hard to believe they can reproduce the high quality on a large scale. Meals are served in three restaurants. L'Etoile is the main dining room on Deck 5 aft; it's open only from 6:30 p.m. to 9 p.m. and serves a variety of cuisine with a Polynesian flare. The room has high ceilings, inset lighting, blond and dark wood finishes, and light blue chairs. Windows line three sides of the dining room, while the fourth wall features shelves that show off more than a dozen ornate vases and dinner platters. Food is served in several courses, generally with a hot and cold appetizer option as well as a soup, pasta course, palate-cleansing sorbet and entree. Appetizers are stellar, with items like tuna tartare and suckling pig as standouts for both creativity and perfect preparation. Chicken cordon bleu, with a light breading and lots of gooey cheese, is excellent, while you can't go wrong with fish options, like almond-crusted mahi mahi. Low-sodium and sugar-free choices are highlighted on the menu, and always-available items include favorites like New York strip and New Zealand salmon. Virtually any special dietary requests (vegan and gluten free, for example) can be accommodated, though Paul Gauguin suggests notifying your booking agent or the cruise line directly ahead of time. The cruise fares include all meals, nonalcoholic beverages, house wines (think Dry Creek, L'Enclos de Saint Jacques and Cline Cellars) and spirits. You also can purchase wines from an extensive cellar list; bottles start at $30. The casual vibe onboard lends itself to open seating, and it's equally easy to secure a romantic table for two or join other travelers for a convivial dinner. The waitstaff is attentive but not intrusive, and the sommelier fills your glass all evening, whether you're drinking wine or a nonalcoholic beverage like iced tea. Reservations are not necessary. Located on Deck 8, Le Grill is a hybrid alfresco dining option for breakfast (7 a.m. to 9:30 a.m.), lunch (noon to 2 p.m.) and dinner (6:30 p.m. to 8:30 p.m.). Diners can sit under cover or out on the pool deck. Floor-to-ceiling windows along both sides of the ship provide breathtaking views of the lush scenery, and glass doors leading to the pool can be opened to let in a breeze or closed when weather isn't perfect. Tables for four or more are available. At breakfast, you can make selections at the extensive buffets. Buffet items include pastries, breads, cold cuts, muesli, cereal, yogurt, smoked salmon, fresh fruit, French toast and pancakes. There's also a made-to-order egg station, and fresh juices are available; you can ask the ultra-efficient waiters to bring you a Bloody Mary or mimosa if you're so inclined. Daily lunch buffets are themed to various cuisines -- including French, Pacific, Greek, Asian and Italian -- so you likely won't have the same thing twice. Cold buffet items are generally excellent, with pasta salads, soups (a cold and hot option), and cold cuts and cheese. Each day, there's also some kind of made-to-order station (pasta for Italian day and stir-fry for Asian, for example). The hot buffet includes proteins and traditional cultural dishes like moussaka on Greek day or fresh fish on the French Polynesian menu. We loved the inventive options, such as the surprisingly fresh-tasting coconut-crusted wahoo and sweet-and-sour chicken with a tropical twist. If you don't find something that appeals on the buffet, you can order from a set menu, which doesn't change. The daily lunch menu includes sliders, burgers and our favorite, the devil's wrap -- a slightly spicy chicken-filled Mexican wrap. Of course, there's an extensive dessert bar with sweets like a tiny chocolate-dipped cannoli or baklava. A sugar-free option (such as poached pears) is available each day. Afternoon tea is served in Le Grill every day from 4 p.m. to 5 p.m. While it doesn't include white-glove service, it does include traditional high tea items like clotted cream, scones and biscuits. Ice cream is served with the tea, as well. For dinner (6:30 p.m. to 8:30 p.m. daily), Le Grill becomes a full-service sit-down restaurant that serves Pacific specialties, fresh local fish, seafood and steak. Reservations are required, though there is no cost. Make your reservations for the first day if you hope to get a seat at Le Grill, as this spot is ultra-popular, and bookings fill up quickly. The suckling pig with pumpkin ravioli appetizer is a blissful mix of sweet and savory, while the seafood crochette, with its rich vanilla sauce, provides a taste of French Polynesia. The atmosphere, whether the ship is anchored in port or sailing the azure sea, is pure vacation bliss, complete with tropical breezes at your back. 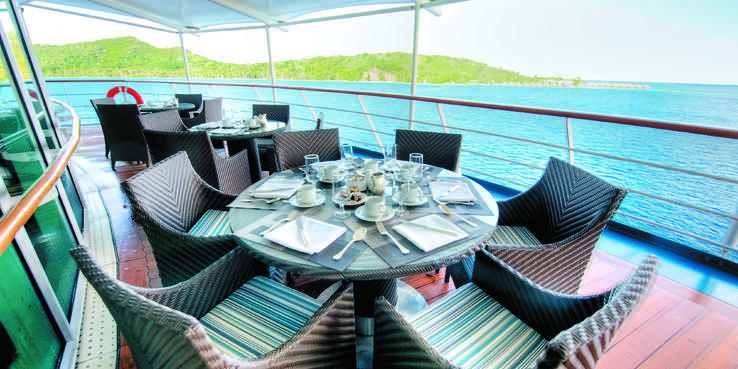 Like Le Grill, La Veranda on Deck 6 serves breakfast (7 a.m. to 9:30 a.m.), lunch (noon to 2 p.m.) and dinner (6:30 p.m. to 8:30 p.m.), and reservations are required for dinner. Make them early to assure you get at least one chance to eat dinner at this spot, where you'll try French delicacies. Breakfast and lunch at La Veranda duplicate the buffet served at Le Grill, though the atmosphere at La Veranda is slightly more formal because of its indoor location. At night, it focuses on French food, and it does so expertly. The set menu includes creative dishes, such as foie gras with sashimi (a strange combination that somehow works perfectly together), a leek terrine with grilled shrimp and a buttery steamed mahi mahi with a to-die-for mushroom sauce. Room service is available 24 hours a day. Choose from items like steak sandwiches, pizza or Reubens. At night, you can order items from the L'Etoile menu and have them delivered to your room. There's no fee for room service, but a tip for the crewmember who delivers it is always appreciated.